The technique has been well described in the pediatric literature. [3, 4, 5] Venipuncture may be more difficult in pediatric patients secondary to nonvisible or nonpalpable peripheral veins. In infants and children, however, cutdown has largely been replaced by intraosseous access as a secondary route of access and is only recommended when all other methods have failed. [7, 8] For a comparison of vascular access methods, see Vascular Access Overview. The great saphenous vein (GSV) is the vessel most commonly used for the venous cutdown. Although the procedure can be performed at multiple sites along the length of the GSV, it is commonly performed at the ankle because the predictable and superficial location of the vein in this area allows it to be exposed with minimal dissection. Moreover, in the midst of resuscitation, [10, 11, 12] this vein's location distant from the primary resuscitative efforts centered on the head, neck, and torso affords unhindered access to the site. Saphenous vein cutdown is indicated for the purpose of emergency venous access (when attempts to gain access via peripheral or percutaneous routes have failed). Anatomic course of great saphenous vein. The small saphenous vein (SSV; also referred to as the lesser or short saphenous vein) does not directly anastomose with the GSV. It begins at the lateral aspect of the ankle and runs up the posterolateral lower leg to join the popliteal vein in the popliteal fossa. Chappell S, Vilke GM, Chan TC, Harrigan RA, Ufberg JW. Peripheral venous cutdown. J Emerg Med. 2006 Nov. 31(4):411-6. [Medline]. Boon JM, van Schoor AN, Abrahams PH, Meiring JH, Welch T, Shanahan D. Central venous catheterization -- an anatomical review of a clinical skill -- Part 1: subclavian vein via the infraclavicular approach. Clin Anat. 2007 Aug. 20(6):602-11. [Medline]. Adelman S. An emergency intravenous route for the pediatric patient. JACEP. 1976 Aug. 5(8):596-8. [Medline]. Gauderer MW. Vascular access techniques and devices in the pediatric patient. Surg Clin North Am. 1992 Dec. 72(6):1267-84. [Medline]. Cole I, Glass C, Norton HJ, Tayal V. Ultrasound measurements of the saphenous vein in the pediatric emergency department population with comparison to i.v. catheter size. J Emerg Med. 2012 Jul. 43 (1):87-92. [Medline]. King D, Conway EE Jr. Vascular access. Pediatr Ann. 1996 Dec. 25(12):693-8. [Medline]. Asaravala M, Kharasch M, Pettineo C, Vozenilek JA, Wang EE. Emergent intraosseous access. Acad Emerg Med. 2008 Dec. 15 (12):1324. [Medline]. de Caen A. Venous access in the critically ill child: when the peripheral intravenous fails!. Pediatr Emerg Care. 2007 Jun. 23(6):422-4; quiz 425-6. [Medline]. Taghizadeh R, Gilbert PM. 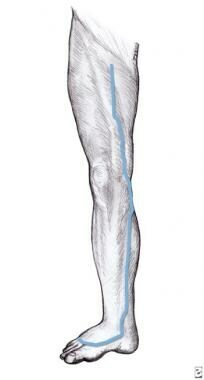 Long saphenous venous cutdown revisited. Burns. 2006 Mar. 32(2):267-8. [Medline]. American College of Surgeons. Advanced Trauma Life Support Student Course Manual. 9th ed. Chicago: American College of Surgeons; 2012. Chameides L, Samson RA, Schexnayder SM, Hazinski MF, eds. Pediatric Advanced Life Support: Provider Manual. Dallas, TX: American Heart Association/American Academy of Pediatrics; 2012. Roberts JR. Roberts and Hedges' Clinical Procedures in Emergency Medicine. 6th ed. Philadelphia: WB Saunders; 2013. Gray H. Anatomy of the Human Body: VII. The veins. 3d. The veins of the lower extremity, abdomen, and pelvis. Bartleby.com. Available at http://www.bartleby.com/107/173.html. Accessed: May 18, 2017. Ker K, Tansley G, Beecher D, Perner A, Shakur H, Harris T, et al. Comparison of routes for achieving parenteral access with a focus on the management of patients with Ebola virus disease. Cochrane Database Syst Rev. 2015 Feb 26. CD011386. [Medline]. [Full Text].